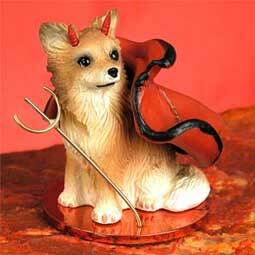 Picture your dog or cat, with a red cape, gold tone pitch fork, red horns sitting on a shiny 1 ½ diameter red disc. We take our hand painted Tiny Ones figurines and mount a set of tiny red horns on its head, attach a red cape and gold tone pitch fork or trident, then place this little devil on a shiny red disc making the cutest little devils around! Each Tiny One measures about 2 tall. These unique collectibles come individually packaged ready to give as a gift, or hang in your store.